NASA’s new budget proposal includes a plan to capture a small near-Earth asteroid so they can safely study and explore it. The below video shows a short animation of the Asteroid Retrieval Initiative. 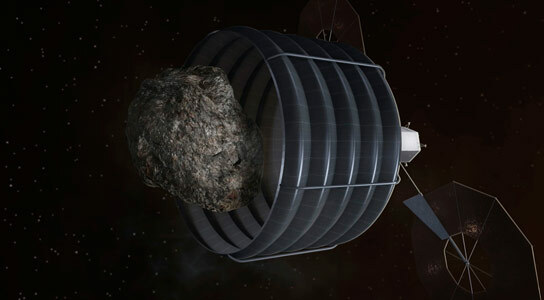 NASA’s FY2014 budget proposal includes a plan to robotically capture a small near-Earth asteroid and redirect it safely to the Earth-Moon system, where astronauts can visit and explore it. The proposed mission would combine the efforts of three NASA mission directorates: Human Exploration and Operations, Science and Space Technology. The astronauts will build on years of knowledge from the International Space Station, exploration mission concepts, scientific spacecraft and ground-based analog missions. Washington — The following are statements from the associate administrators of NASA’s Human Exploration and Operations Mission Directorate, Science Mission Directorate and Space Technology Mission Directorate on the administration’s budget request for the 2014 fiscal year. 4 Comments on "Asteroid Retrieval Initiative – NASA Plans to Capture & Explore an Asteroid"
Very ambitious. So would that count as a second moon for Earth? Why envelope it? Wouldn’t a simple tow line be easier? Obviously, Dave, it’s going to be an awfully small asteroid, so undifferentiated due to early internal heating. There are two main types of meteorite but essentially, the asteroids are all thought to have formed as a group so one is pretty indicative of the rest AFAIK. The whole world is in turmoil. The water, the air, the food is all polluted. The people more n more poor, dying of malnutrition, loosing their houses, her jobs and their minds. No money for anything, and you are thinking in how to catch an Asteroid???? We have SERIOUS problems down here and that’s where the money should be spent HERE! Not out there. Finding other worlds to live?? To have another planet to destroy! We shouldn’t be allow to go ANYWHERE in space until this planet is back in shape! But again, who is creating the geoengineering that is destroying our planet and ourselves????? I think it is a collasal waste of taxpayers money just to buy a few votes with as in throwing the pigeons some crumbs to placate them..I think it would be much more important and sustaining with a resasonable payback for the dollar spent by actually building a real Space Station which would be used to build a real Space Exploration Vessel in Space powered by Nuclear Engines and or Solar Power with other power sources in reserve or power boosts. We could actually build a U.S.S. Enterprise with the the knowledge we have now without replicators or Ion fusion engines or whatever of course, but we could do it. I think this would be more beneficial to far more Americans than this current plan which is short lived and really of little use to the Country.